Harris 62-5FL 21 Heavy Duty Straight Cutting Torch. Welcome to Harris Welding Supplies. The 62-5FL is a heavy-duty straight cutting torch designed to give maximum performance using low-cost alternate fuel gases (propane or propylene based fuels and natural gas). Our special "F" injector can produce the hottest flame possible at the lowest gas pressures, making it the safest, most efficient design in the industry. The industry standard by which all other designs are compared. The 62-5 is less expensive to own and operate, and safer to use. Harris Welding Supplies is family owned and operated. We have been serving the welding industry for over 25 years. You can speak with a real person at any time for technical questions or help in the application processes. For more welding related items. 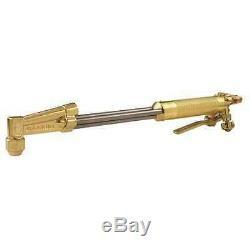 The item "Harris 62-5FL 21 Heavy Duty Straight Cutting Torch 1003470" is in sale since Wednesday, September 4, 2013. This item is in the category "Business & Industrial\CNC, Metalworking & Manufacturing\Welding & Soldering Equipment\Welding\Welders, Cutters & Torches\Gas Welding Torches". The seller is "torchking" and is located in Monroe, Ohio. This item can be shipped to United States.